"What I’m learning is that people really, really are interested in having this conversation about what our future looks like. I think that people—I think we see really strong support for the idea of diversifying our economy,” said Jeremy Richardson, a Fellow with the Union of Concerned Scientists. 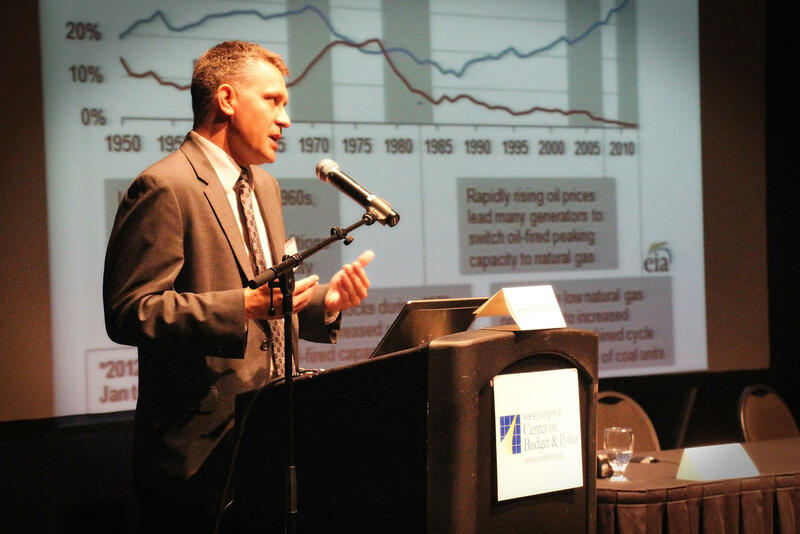 Although his organization usually focuses on issues related to climate change and renewable energy, Richardson noticed the need to apply those issues to the state's economy and helped organize the Bright Economic Future Conference. West Virginia Center on Budget & Policy Executive Director Ted Boettner says a diverse, healthy economy ultimately comes down to a healthy and financially stable workforce. But, he said, the state has struggled with that in recent decades. 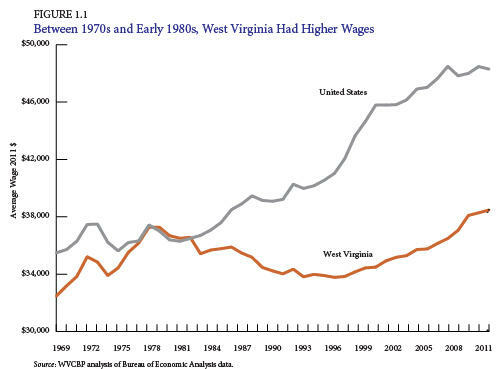 The graph shows the average wages for West Virginia workers from 1969 to 2011. “Back in the late ‘70s there was a time when middle-class families were fairing pretty well. Our wages were a little higher, more people had benefits, you could raise a family on one income. Those times have dramatically changed,” Boettner said. During a panel focused on the potential of moving the economy forward, Kent Spellman of the West Virginia Community Development Hub noted that his organization believes that working directly with people in small communities is the key to improving the economic picture. “We really believe, frankly, that economic transition—this is a great group of people—but, for it to work, we have to get out in our communities and we have to listen. The Hub and the work we do with smaller, rural communities—and we mostly work with smaller, rural communities—focuses on wealth creation, not job creation. We want to see communities create opportunities—economic opportunities—that are locally based, that are placed based, that keep the wealth in the community,” Spellman said. Both Richardson and Boettner echoed Spellman’s call for a grassroots-oriented, localized push for the diversification of the state’s economy. Richardson said that means it’s up to each community to play a part in deciding how they can contribute to the state’s economic future. “I think it depends on where you are. We were just listening to one of the commissioners of Fayette County who was talking about all of the wonderful opportunities they have taken advantage of there,” he said. Richardson also pointed to business projects in unlikely places, such as Sustainable Williamson in Mingo County—right in the heart of an area known as the Billion Dollar Coalfield. “I think it depends on your location to some extent. The message that I’m trying to get out there is that we need to expand peoples’ idea of what’s even possible,” he explained. Other presentations at the conference included Richardson’s discussion of sustainable economic development, a lecture from Boettner on the proposed state Future Fund, and a screening and discussion of the interactive film Hollow, directed by McDowell County native filmmaker Elaine McMillion.